Musicians Institute (MI), The MF and The Grammy Museum are proud to present the next class in the 2010-2011 series of MI-sponsored Grammy Museum Music Education classes for LA Unified School District high school students in the Museum’s intimate Clive Davis Theater. 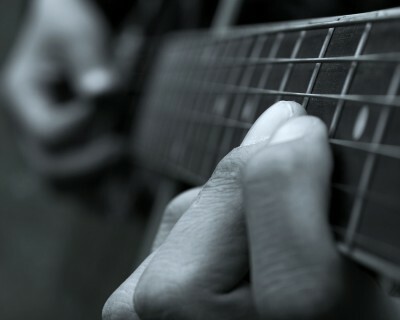 Interested in songwriting? In this workshop, students will learn the important steps of lyric writing; casting your song like a movie, how to create story lines and characters and how to add attitude to your metaphors, similes, rhythms and rhymes with exercises and examples. Students should bring a pencil, paper and their imagination! Anika Paris is an ASCAP award winning singer/songwriter and published songwriter with Universal Polygram and Warner Bros. Her songs are featured in several major motion pictures and major network TV series, on seven CD releases, and she has also performed onstage with many major artists including Stevie Wonder, et al. She has been teaching Songwriting, Artist Development, Performance and Voice at MI since 2002. For 2010-2011, Musicians Institute is the exclusive music college partner of The Grammy Museum Education Program. MI is a major sponsor of The Grammy Museum, since 2008. 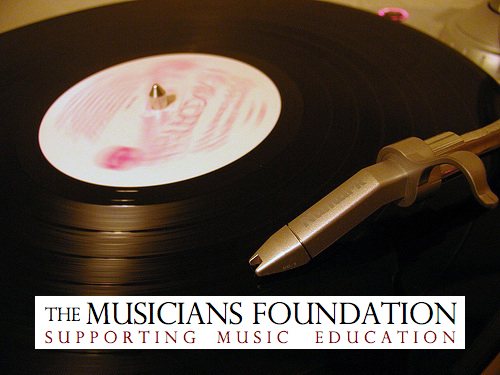 The Musicians Foundation is a non-profit partner of the Grammy Museum. New Drum Scholarship Announced: The Marky Ramone Drum Scholarship! MI Announces Marky Ramone Drum Scholarship—applications available NOW! 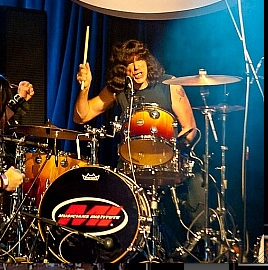 The Marky Ramone Drum Scholarship (valued at $7,000), was created to honor Rock legend Marky Ramone and will be awarded in Spring 2011 to a student (US or non-US citizens) enrolling in the Associate of Arts in Performance (Drums) program who demonstrates overall outstanding musicianship and stylistic ability in the Punk and/or Rock genres. 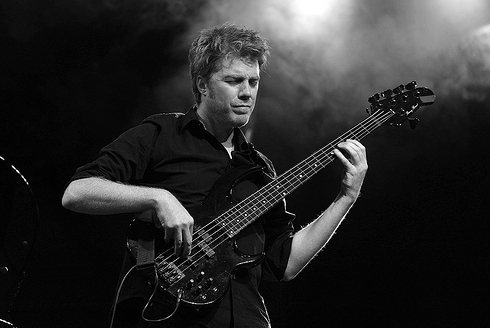 THIS SATURDAY:::The Kyle Eastwood Quintet:::Jazz Bakery@MI Concert Hall, 8 & 9:30. FREE TIX FOR MI STUDENTS – in Student Affairs Office. Make your tax deductible donation to help MI students by Dec. 31st 2010! Will you help us to support music education? We’re asking you to help by making a donation to The Musicians Foundation Scholarship Fund for MI student scholarships. Even a small donation (from $10 and up) to our non-profit 501(c)3 is tax-deductible, and would greatly help a talented, but struggling MI student!!! All of us at MI are very proud of our successful graduates from the more than 30 years that we’ve been teaching the world to make great music. Thousands of MI alumni are part of MI’s elite, unique and vibrant legacy within the music industry, each having fulfilled the creative vision of our founder Howard Roberts. We want to inspire and support future generations of MI students to attain to even higher levels of artistic and professional success, and to pursue their dreams and careers. We’d like to personally invite you to be a part of the MI legacy in a new way. “HUMANITY THRU MUSIC” Benefit Concert & dinner Sat., November 6th @MI Passage and Concert Hall. Special MI Student discount tickets (purchase @box office/walk-up on Sat.) show & dinner for $10! You must show your MI student ID and matching personal ID – 1 ticket per student only. Box office opens at 5:30 in the Passage. Event ticket includes pasta buffet dinner, silent auction, dessert (6-8pm) and YOSO concert (8:30-10pm)! YOSO will play platinum selling hits from both bands Roundabout, Owner Of A Lonely Heart, Rosanna, Hold The Line and so much more!! 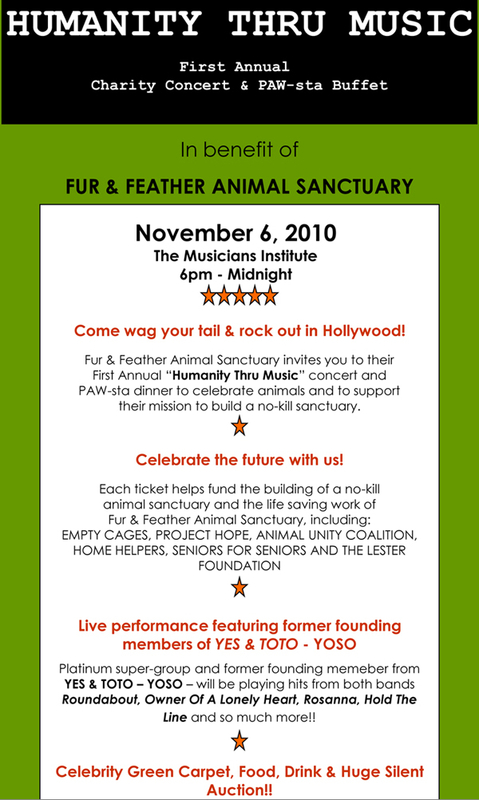 Legendary WENDY DIO joins SHARI BELAFONTE, PAUL DINI, TYLER MANE, JIM LADD of KLOS in support of MUSIC THRU HUMANITY Charity Benefit for animal sanctuary Concert at MI.Huge Silent Auction with autographed items from Joe Satriani, Rob Zombie, Paul Gilbert, Steve Vai, Alice Cooper, Marky Ramone, & many other rock stars. Hollywood Bowl tickets, signed Star Wars collection w/Skywalker Ranch wine, signed sports memorabilia, dinner at Sugar Rock, a night at Luck Stick bowling alley for 8-16 guests & much more. The Kevin Hernandez Memorial Guitar Scholarship is provided to encourage the educational growth of a student entering the Associate of Arts in Performance (Guitar) program at Musicians Institute in Spring 2011. The scholarship was created to honor the memory of Kevin Hernandez, who possessed a tremendous love, dedication and passion for the guitar during his lifetime. The $1,000 scholarship will be awarded to a newly enrolling GIT student who displays passion, talent and outstanding musicianship within the Latin-Rock or Latin–Pop genres. The deadline for the scholarship application is March 14, 2011.